I love frittatas because you can put just about any filling in them that you want. 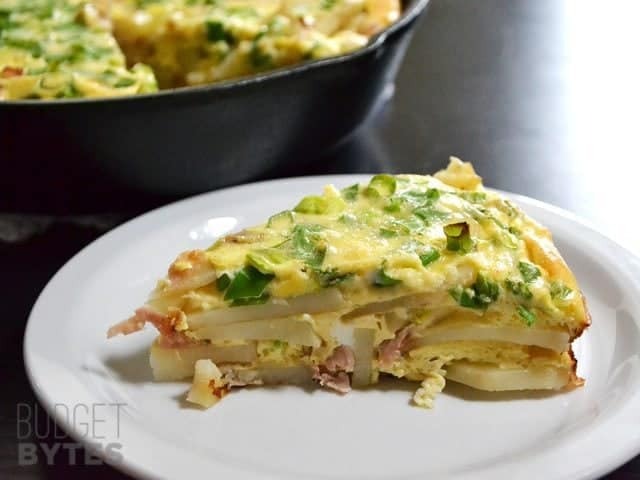 I’ve added thinly sliced potatoes to this frittata, which creates an awesome texture and makes it extra filling for very little cost. 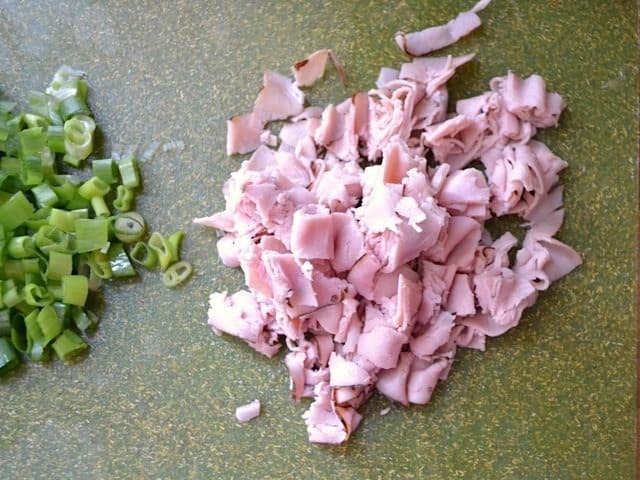 I threw in some ham for good measure, although you could always add some crumbled bacon or extra veggies. 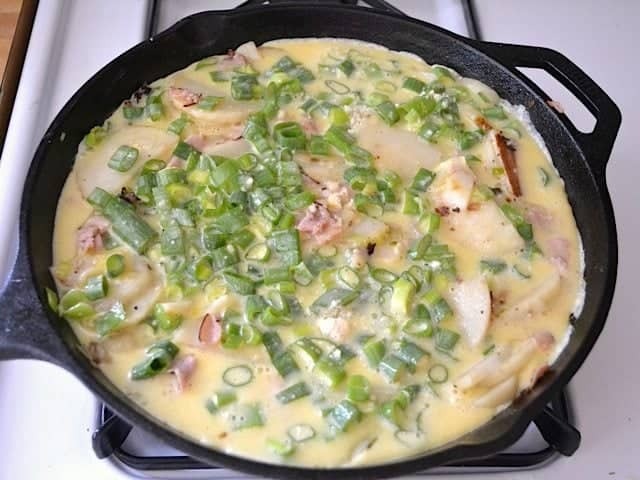 I went light on the cheese for this frittata so that it wouldn’t be so heavy, but if you like cheesy you could always add some shredded cheese to the top or mixed into the eggs. Either way: NOM. I’ve been reheating slices of this in the microwave all week for breakfast (excellent with some sriracha! ), and I also tried freezing and reheating a slice. It survived the freeze/reheat cycle well (microwaved straight from the freezer until hot)! Egg dishes like this always seep a little water upon reheating, but I still found it to be quite delicious and satisfying. Just make sure not to over cook the eggs to begin with and you’ll be good. So, have fun tonight and be careful with those fireworks… cooking is a lot more difficult when you’re missing half of your fingers! 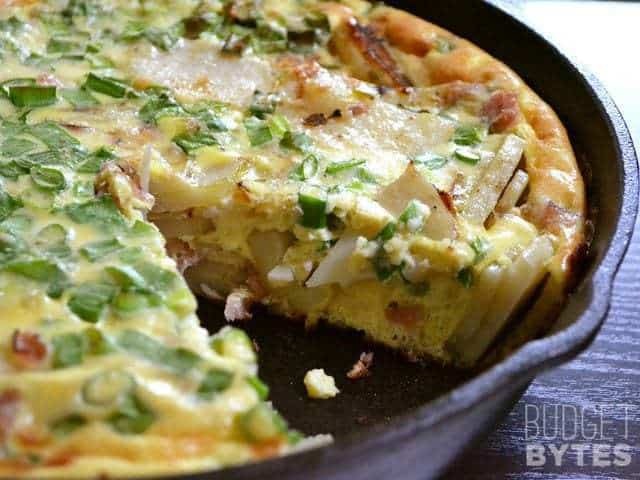 Potatoes, eggs, and ham, this frittata is all of your breakfast favorites in one dish. Filling and flavorful on a dime. 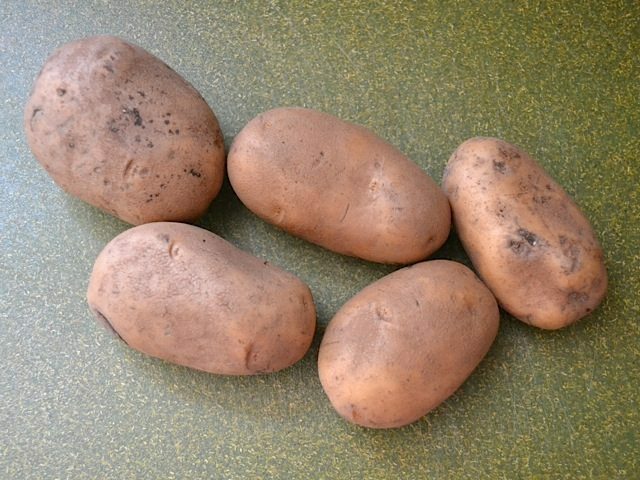 Wash, peel, and slice the potatoes into thin, 1/8" thick slices. Heat the olive oil in a large oven-safe skillet over medium heat. 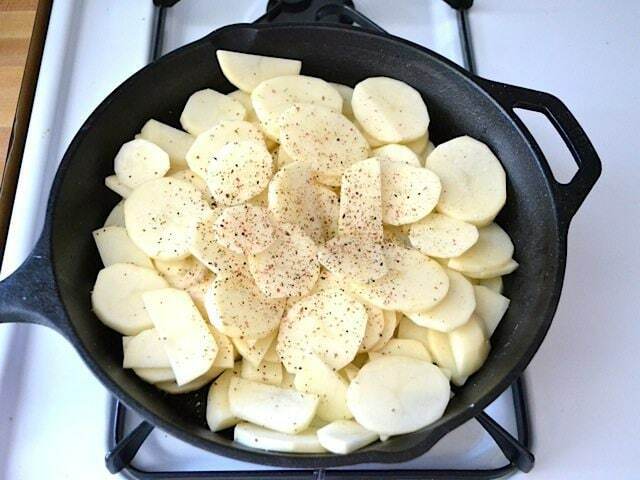 Once the skillet is hot, add the potatoes and season with salt and pepper. Cook the potatoes for about 10 minutes, stirring only occasionally so that the bottom layer has a chance to brown. Preheat the oven to 400 degrees. 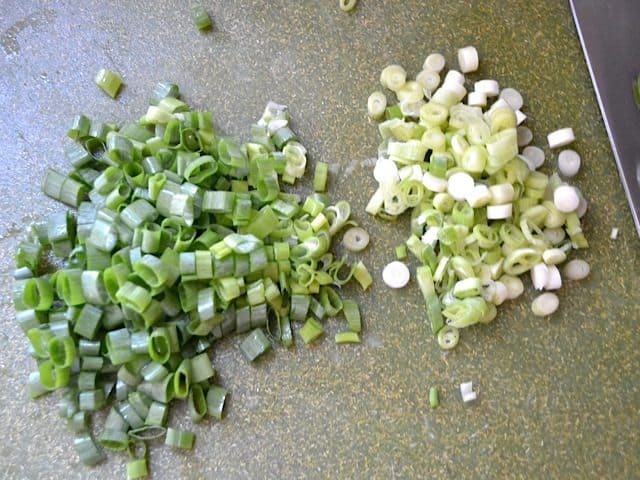 While the potatoes are cooking, slice both the green and white ends of the green onions. Add the white ends to the skillet with the potatoes as they cook. Also roughly chop the deli ham and add it to the skillet as the potatoes cook. In a large bowl, whisk together the eggs, milk, and parmesan cheese. 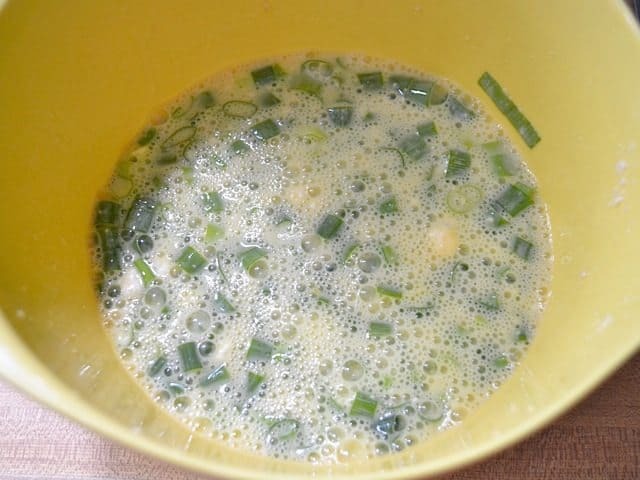 Once the mixture is fairly smooth, stir in the remainder of the sliced green onions (the green ends). 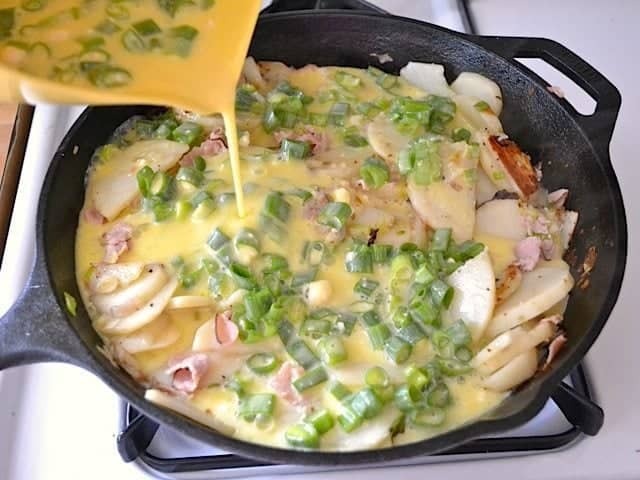 Once the potatoes are tender, but not falling apart (about 10 minutes of cooking), pour the egg mixture into the skillet, making sure to cover all areas. Continue to cook the mixture in the skillet without stirring for 1-2 minutes, or until the edges are set. Transfer the skillet to the oven and continue cooking for about 20 minutes, or until the egg has puffed up and eggs are set (firm, but still moist). The center of the skillet will firm up last, so test the center for doneness. 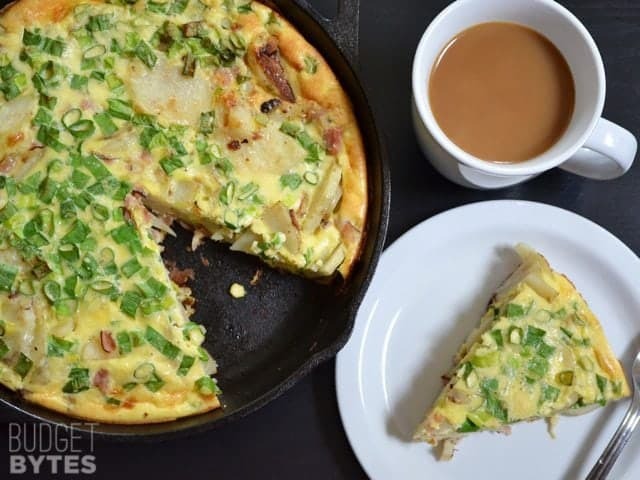 Allow the frittata to sit for five minutes before slicing and serving. The cooking time in the oven will depend on several factors including the thickness/size of your skillet and how cooked the eggs were prior to transferring the skillet to the oven. Keep an eye on it and start checking for doneness at 15 minutes. I used about 2 pounds of potatoes, or just under half of my 5 lb. bag. I chose Russet potatoes, although I think Yukon Gold would also work well. Wash, peel, and thinly slice the potatoes. Heat the olive oil in a large oven-safe skillet over medium heat. Season the potatoes with salt & pepper. Cook the potatoes in the skillet for about ten minutes, only stirring occasionally (this gives the bottom layer time to brown). Also start preheating the oven to 400 degrees. While the potatoes are cooking, slice the green onions. I used both the white and green ends for this dish. Add the white ends to the potatoes as they cook. Also roughly chop the deli ham and add that to the skillet as the potatoes cook. Whisk together the eggs, milk, and parmesan cheese. Once those are whisked together, stir in the green ends of the green onions. After about ten minutes in the skillet, the potatoes should be tender, but not really falling apart. They’ll also be nicely browned in spots. Pour the egg mixture into the skillet, making sure to evenly cover the potatoes. Let the skillet continue to cook for one-two minutes more, or until the eggs are set around the edges, then transfer the skillet to the oven (make sure you’re using an oven safe skillet). Bake the frittata for about 20 minutes or until the edges are all puffed up and the center is no longer liquid. You want the center to be firm, but still very moist. 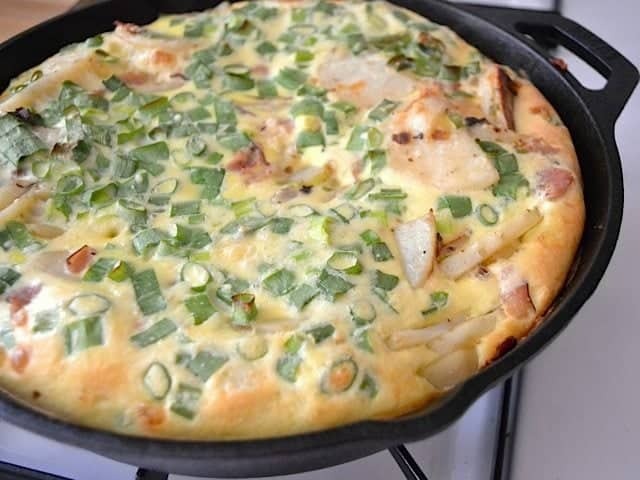 Allow the frittata to sit for five minutes before slicing and serving. So filling, so good, and so inexpensive! This looks delicious! I’m planning on trying this recipe tonight, with some different mix-ins, but I’m confused about what to bake it in. It looks like you’re using an iron skillet – won’t the eggs stick, even if you grease it? Would it be better to bake it in a pie plate? Thanks! Yes, I baked it in a cast iron skillet, and it didn’t stick. :) If you want to do a pie plate you can, just transfer everything after the sauté steps to the pie plate. You may need to bake slightly longer since the pie plate won’t be hot like the skillet was. Made this for dinner last night. Had just used up the last of my green onions so I used yellow onion instead. Was a little bland (maybe because of the yellow onion) so I added salsa on top while eating. Loved it! I meant to say a cookie sheet, such as an 8×8 or a 9×13. My apologies!! You could cook the potatoes in a skillet then add everything to a casserole dish. :) I think an 8×8 is probably the right size. 9×13 would most likely be too big and then the egg would be too thin. Made this tonight for dinner; yummy! Made this yesterday. Best thing I’ve ever made. Reheated it and ate it today. STILL amazing. I just tried this recipe today. IT was delish! Had to make a few changes, mostly in that I used a yellow onion that I fried up with the potatoes instead of green, and fewer eggs. I missed the Parmesan totally but some cheddar on top just made it perfect. I made this today using an 8×8 baking dish, peas instead of green onions, and extra cheese and it turned out great. I cooked the potatoes a little longer than suggested, and wish I did even longer still, since a few if the thicker slices aren’t as soft as I would like, but it is still delicious. I don’t eat cheese – if I leave it out, how much will it affect the consistency of the dish? Is there something else I could add to make the egg/milk mixture thicker instead of cheese? Thanks!! Hmm, I haven’t tried it without the cheese, but I suspect it’s pretty integral to the texture. I’m not sure what could be used in its place. Thanks for your quick response, Beth! I made this tonight and it was great! I used bacon fat instead of olive oil and that made it extra delicious, definitely making this again. just made for a brunch and was a hit for all. i love this recipe for using up odd bits of veg i have laying around. i just grate everything up and mix it up. i was wondering if this is safe to freeze? there seems to be a lot of mixed answers on the internet regarding freezing eggs i was wondering if you have ever tried? Just made this (kinda) and LOVED it! My husband about 1/2 of it at dinner! I had a little over 2 pounds of red potatoes that I cubed (skins on) and a cup of ham in the freezer along with some eggs that needed to be used up. This was a great, easy way to use up s few odds and ends :-) We are a fan of firttatas for that reason! Almost anything is good in them!